Throw a stone anywhere in Texas and you’re likely to hit an award-winning barbecue joint. The tradition of slow-roasted barbecue is deep in Texas blood, with many of the best, most delicious, and affordable barbecue joints in the world spread all throughout the state. While just about any spot is worth a visit, the following 10 stand out as exemplary. Check out our top ten barbecue joints in Texas. Famed American chef and television personality Anthony Bourdain has a favorite barbecue joint: Franklin’s. “It is the best. It is the finest brisket I’ve ever had,” he is quoted as saying on their front page. With an endorsement like that, how can we not include them on our list? Texas Pride Barbecue has been family owned and operated for over 20 years. They’re known for their delicious mesquite smoked meats and live music. Keep in mind that they’re not open Mondays, so make sure to get your fill Tuesday-Sunday. Lockhart Smoke House has two locations, one in Dallas and another in Plano. They’re one of Texas Monthly’s “50 Best BBQ Joints.” Stop by for brisket, ribs, sausage, and more. Kreuz Market has four locations throughout the Lone Star State. Stop by their Bee Cave, Plano, Dallas, or Lockhart locations, or consider ordering their “mail order” barbecue. They’ll ship barbecue beef, pork, turkey, and sausage in specially designed boxes for you to enjoy anywhere in the country. Louie Mueller Barbecue is one of the best reviewed barbecue joints. Period. They’ve been in business since 1949 and are the recipient of the prestigious James Bear “American Classics” Award. The reviews speak for themselves, but if you can’t make it to Taylor to try, they offer barbecue by mail, too. Hutchins BBQ has been featured in the Texas Monthly’s “50 Best BBQ Joints,” the Dallas Observer’s the “Best of Dallas 2016,” and much more for their excellent food. Come in to their McKinney or Frisco locations, or reach out for catering options. Just follow the smoke. Snow’s BBQ is Texas Monthly’s #1 choice for BBQ in 2017. Their world-famous pit master Tootsie Tomanetz attracts visitors from all over for her tasty, tangy barbecue. They’re open every Saturday starting at 8 a.m. until they’re sold out. Since 1967, the Salt Lick BBQ has provided Texas with absolutely incredible food. They’ve been featured on “Man v. Food.” Choose from brisket, pork ribs, sausage, vegetables, and turkey. Keep in mind, they only accept cash and they have locations in Driftwood, Round Rock, and the Austin and Dallas airports. Opie’s BBQ in Spicewood, Texas, is another award-winning barbecue joint. 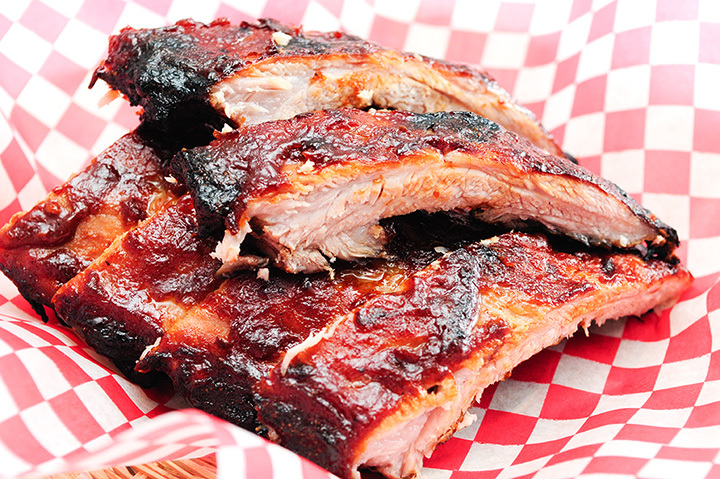 Order brisket, turkey, sausage with jalapeno or cheese, pork ribs, pork chops, baby back ribs, and much more. Don’t forget dessert: we recommend the cobbler. Tejas Chocolate Craftory combines two of our favorite food items: chocolate and barbecue. How did they begin? According to their website, they “just followed the path.” They make chocolate and truffles from raw cocoa beans and slow smoked briskets, all of which is scrumptious.